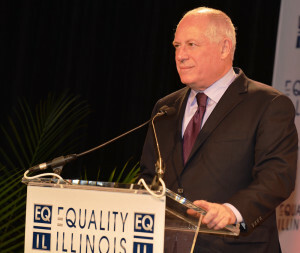 CHICAGO (January 4, 2016) – The Equality Illinois Political Action Committee (EQIL PAC) will host a reception with former Illinois Governor Pat Quinn on January 14 to support the EQIL PAC’s mission of electing pro-LGBT equality candidates to state and local offices. “Gov. Quinn is a great friend of the LGBT community and, among many other achievements, was instrumental in passing and implementing marriage equality,” said Nicole Bashor, Chair of the EQIL PAC. “He also recognizes that advancing equal rights and ensuring lived equality in Illinois requires identifying, supporting, and electing pro-equality people to public office,” Bashor said. The reception with Gov. Quinn will take place at Hubbard Inn, 100 W. Hubbard Street, Chicago, on the evening of Thursday, January 14. Details and tickets are available at www.EQILPAC.eventbrite.com. Gov. Quinn is a steadfast advocate for the equal rights of LGBT Illinoisans. He not only advocated for and signed the marriage equality law in 2013, but he also approved strong anti-bullying protections and the civil unions law and led an administration that was welcoming and affirming for LGBT Illinoisans. Through candidate questionnaires, endorsements, campaign contributions, and field support, the EQIL PAC works to secure and defend the equal rights of LGBT people in Illinois. The EQIL PAC is the only political action committee in Illinois that is dedicated to electing individuals to public office who will fight for the equal rights of LGBT Illinoisans. The EQIL PAC is engaging in the 2016 primary and general elections in Illinois. This effort involves evaluating candidates based on their support of policies and proposals that advance LGBT equality. More information about the EQIL PAC is available at www.EQILPAC.org.